Emma: Hi Matthew! How has your time with Digital DNA been so far? Matthew: I’ve only just began my journey with Digital DNA, but already feel so welcome by the team, and motivated by their support and encouragement to quickly upskill and begin to immerse myself in the Events industry. E: What have you been up to before joining our team? 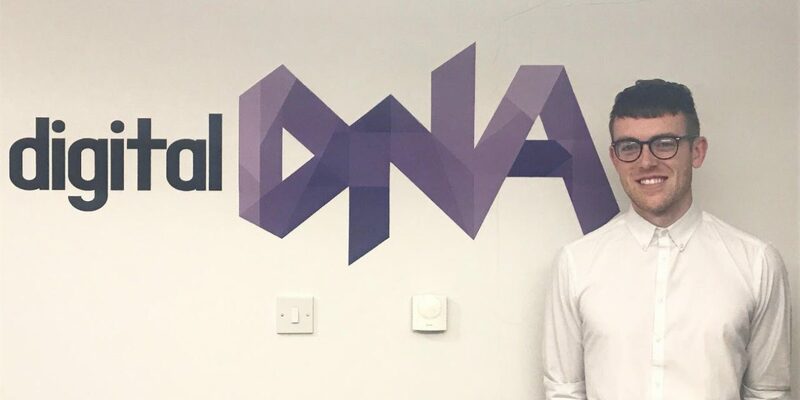 I come from a background of selling Software Solutions, therefore moving to Digital DNA’s business development team is a significant change for me, but one that I’m fully confident was the right decision. E: Great, you had mentioned immersing yourself into the Events industry- Have you attended any events recently? M: Given my lack of experience in the events industry, it was very important for me to gain on-hand insight early. I was given the chance to take part in the setup, live and takedown operations of a recent event, and was also given the opportunity to attend Big Data Belfast last week, which was something I really welcomed and thoroughly enjoyed. Attending an industry-relevant conference was a great way to get an understanding of the format, delegate demographic and overall feel of a successful technology based event. E: What are you enjoying most about being a part of the team? M: Having now spent several weeks with DDNA, I’ve been able to get a real sense of the core fundamentals of the company culture. The non-hierarchical, positive team are clearly very focused on doing things right. This can be seen during the event build-up, with every detail covered and all potential mishaps accounted for. But can also be seen right through the office environment, with continuous open conversations and a collaborative “no silly questions” approach taken by all of my colleagues. I’m really looking forward to the coming months and years with such an exciting, welcoming company. E: And do you get up to much outside of Digital DNA? M: I’m very passionate about running, I’ve been training and competing now more seriously for about 2 years. I’ve raced in every distance from 800m to ultra-marathons, and now focusing more so on the shorter distances. It more or less takes over my life during the season, and while I dream of getting to travel the world for top quality races, so far the sport has taken me to farmers fields in Cookstown and the likes. But I’m working on it. E: Before we let you go, tell us an interesting fact about yourself. M: I’ve been fly-fishing from I was really young, and been very lucky to get to fish at lakes all over. I actually had an article published about my angling antics in The Sun when I was 5 years old, but I’ve made sure that stays well hidden for the rest of time! Interested in exhibiting or partnering with us or want to know more about potential opportunities available for your company at Digital DNA 2019? Give him a call on 028 9751 2135, or send an email over to matthewD@digitaldna.org.uk .